India will launch its first manned space mission by 2022, Prime Minister Narendra Modi said on Wednesday in his last Independence Day speech ahead of the 2019 general election. Modi, a powerful speaker who will seek re-election in the world’s biggest democracy early 2019, used the speech to broadcast his government’s achievements, amid concerns about lack of jobs and rising violence against the Muslim minority. NAN reports that general elections are due to be held in May 2019. Wearing a flowing saffron turban, the Hindu nationalist leader also announced the plan to take the “Indian tricolor to space” in a manned mission that would make India the fourth nation to launch one, after the U.S., Russia and China. 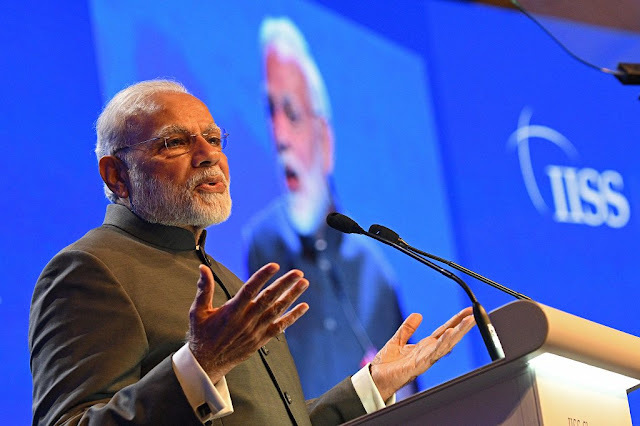 “India is proud of our scientists, who are excelling in their research and are at the forefront of innovation,” Modi said from the ramparts of the Mughal-era Red Fort in Delhi to a crowd numbering in the tens of thousands. Months after Modi’s election in 2014, India became the first Asian nation to reach Mars when its first mission to the red planet entered orbit, at a cost of 74 million dollars, or less than the budget of the Hollywood space blockbuster “Gravity”. Modi said his government would launch from Sept. 25 a previously announced medical insurance scheme, dubbed ‘Modicare’, to give about 500 million poor people annual health cover of 500,000 rupees (7,200 dollars) to treat serious illness. Critics say that while Modi has adopted several initiatives, his tenure has been marred by violence against Muslim cattle traders and economic jolts through a countrywide ban on high-value notes and the botched launch of a unified taxation system. Businesses have embraced the unified Goods and Services Tax after initial hiccups, Modi said in his speech. In his 80-minute speech, Modi said the pace of building highways, electrifying villages and building toilets has increased since his landslide 2014 election win that devastated the main opposition Congress party. Congress, which had ruled India for decades, is now trying to unify the opposition to challenge Modi, whose personal ratings remain high despite recent election setbacks.